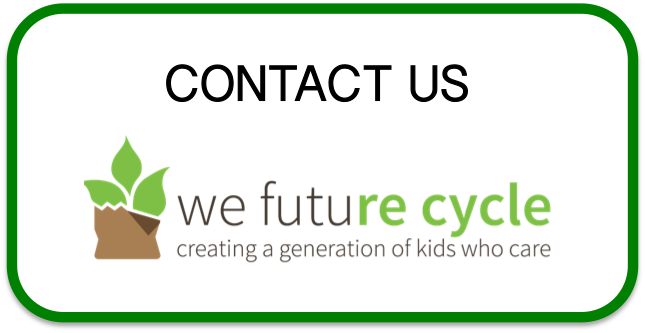 Rye Middle School joined all of the Rye Elementary Schools in implementing the We Future Cycle recycling-composting program. The launch was a huge success as all of the incoming 6th graders and most of their 7th grade school mates have done the program in their elementary school, they easily fell back into the routine of quickly sorting their waste. And 8th grade matched their stride with great enthusiasm. Rye MS usually generated 140 lbs of waste from about 1000 students, in an impressive pile of 12 bags, all carried out one by one by the custodial staff, leaving behind a trail of dripping milk. But no more, the We Future Cycle program separates liquids from packaging, and food from packaging. Easy quick movements to empty and sort. And the results are always the same. A stunning 96% diversion rate into recycling and composting. Only 6 lbs or 4% of the 140 lbs was non-recyclable and will have to be transported for incineration by Westchester County. That of course also means that 96% of the material is not adding to our air pollution, and we will retain the resources by recycling and composting them. Truly a win win on all sides. And the numbers are adding up. A daily 136 lbs reduction in waste over the course of a school week is a 680 lbs reduction, and over the course of a school year, a whopping 12.25 TON reduction. That translated into volume and garbage bags would fill a school auditorium. 2200 bags of materials, diverted away from the garbage. Truly something to be proud of. And that is just one of the Rye schools! The RMS community, led by principal Dr. Ann Edwards, were instrumental in achieving this result. And what a journey this has been. From the humble beginnings of a single lunchroom to now soon over 40 schools, covering New Rochelle, White Plains, Rye, Blind Brook and soon also Mount Vernon schools. We have also worked in Eastchester, Ossining, Pelham, Tuckahoe and Mamaroneck. In numbers, that is nearly 33,000 students that are sorting their waste every day. 33,000 students that have learned that there is no away on this earth. 33,000 students who now know about composting and recycling. It also means that 33,000 Styrofoam trays have been eliminated from the waste stream every single day. Every one of these districts was using foam trays before We Future Cycle advocated for the clean switch to compostable materials. Styrofoam trays contain Styrene, now a classified human carcinogen, are proven to leach chemicals into the food that touches them. We are proud to have been instrumental in eliminating Styrofoam from the menu of 33,000 students. 33,000 students’ food waste is not going any longer to the incinerator to be burnt into our air, instead, it is being composted, creating nutrient rich soil, often sold as potting soil at hardware stores throughout New York State. And these 33,000 students have families and communities they have changed by bringing the knowledge home and creating change. We are excited to be saving the world one district at the time and creating a generation of students that care. Come and join us if you feel strongly about teaching children to become environmentally literate.